One of the most violent sun storms in recorded history erupted 11 years ago today (July 14). As the magnetic field lines became more and more twisted, magnetic potential energy built up, similar to how a roller coaster car at the top of the track builds up gravitational potential energy, which is then converted to the kinetic energy of motion as the car zooms downward. One million degree hot solar plasma travels along magnetic loops in the sun's atmosphere during the Bastille Day solar storm of 2000. When the magnetic potential energy of the sun finally hit a certain point, it snapped, releasing that energy in the form of heat, light and the motion of particles. 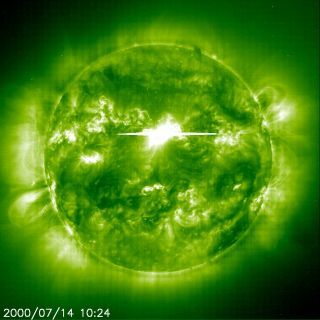 Plasma on the sun was heated up to 20 million or 30 million degrees Kelvin (36 million to 54 million degrees Fahrenheit). Plasma particles were accelerated along giant loops that traced magnetic field lines down through successive layers of the sun's atmosphere. These loops connected to form large ribbons of superheated plasma. At the same time, some plasma particles from the sun's atmosphere were accelerated away from the surface, out into space. Such a release of material is called a coronal mass ejection. Many of these protons and electrons made their way to Earth, where they disrupted satellites and blocked radio communications. "The holy grail, which is not solved yet, is, what is the actual trigger mechanism that causes this buildup of energy to be released?" said Phil Chamberlin, a solar scientist at NASA's Goddard Space Flight Center in Greenbelt, Md. However, the Bastille Day solar storm did go a long way toward helping scientists piece together a general theory of how eruptions on the sun occur. "This theory is all based on observations from the Bastille Day flare," Chamberlin told SPACE.com. That knowledge will come in especially handy in the coming years, as the sun ramps up toward a peak in its 11-year cycle of activity. Near the end of 2013, we are likely to see storms that rival, or even surpass, the Bastille Day event.